The constraints embedded in the relationship markers allow Heurist to build facetted searches, custom reports and network rules through a ‘wizard’ approach, as well as plotting more meaningful network diagrams. Related records are displayed in a separate section RELATED within the record view (image above). This display includes the term from the vocabulary as well as the linked record, which is highlighted in blue and can be opened by a single click. In the example shown above, the only Related Record for Juliet Capulet in the Shakespearean play, Romeo and Juliet, is the Character, Tybalt, who is her cousin. She is also linked to various other records through simple Record Pointer fields, such as the characters of Romeo and Friar Laurence, the play of “Romeo and Juliet”, the House of Capulet and an actress who played Juliet. 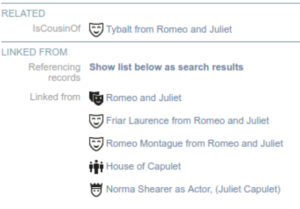 Note that some of these pointers appear in the data for Juliet – these are pointer which point at other characters – while others only appear in the LINKED FROM section as these are pointers in other records which point AT Juliet. The main difference is in the edit screen, where the type of relationship is included, as well as the record which is being related. In the example given above, Lady Macbeth is shown to be related in marriage to Macbeth (in the play, Macbeth). Furthermore, as well as the records to which one has defined links from the record being edited, the edit form also shows links from other records to the record one is editing. This can help to identify relationships that may not be inherently obvious in the data for that record. For example, shown above is the record for Duncan, king of Scotland in the play Macbeth. Two other characters in the play: Malcolm and Donalblain, have designated Duncan as being their parent (hasParent). Thus when we edit the record for Duncan, the reverse relationships from the records for Malcolm and Donalblain are now shown, allowing us to avoid duplication of these relationships, as well as showing the links themselves.